In 1983, a group of childhood friends pulled off the crime of the century: kidnapping one of the richest men in the world, the heir of the Heineken beer empire (Anthony Hopkins). The shocking capture—by gunpoint in broad daylight on the streets of Amsterdam—resulted in the largest ransom ever paid for a kidnapped individual. It was truly the perfect crime… until they got away with it. 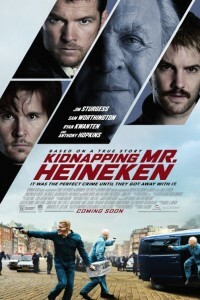 Based on a true story, the movie Kidnapping Mr Heineken also stars Sam Worthington, Jim Sturgess and Ryan Kwanten. Watch the Kidnapping Mr Heineken trailer.